Samsung Galaxy Note smartphone, which comes with a plethora of features that spill over to tablet type functionality as well, is now available in Bangladesh via unofficial channel. Samsung Galaxy Note is a hybrid between a smartphone and a tablet. With Galaxy Note, Samsung aims to target users who want both a smartphone and a tablet but do not want to invest in both. Samsung Galaxy Note run on Android 2.3 Gingerbread, it will be getting Android 4.0 Ice Cream Sandwich update sometime early next year. 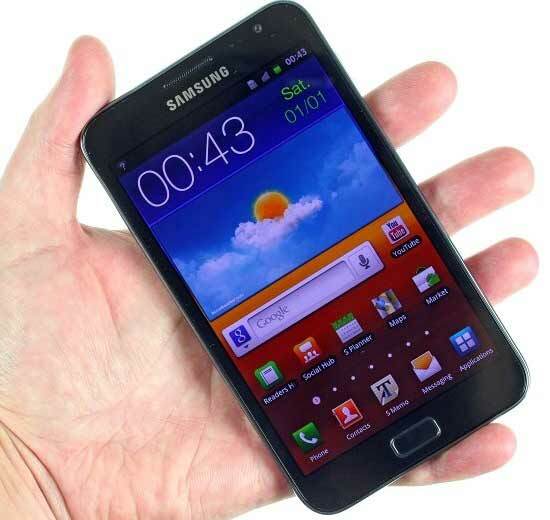 The Galaxy Note is the first device to sport a 5.3 inch HD Super AMOLED display. The display sports a native resolution of 800 x 1280 pixels and supports multi-touch and also comes with the S (Smart) Pen stylus that allows the users to go creative with all their might. Galaxy Note is powered by a 1.4 GHz dual-core processor. There's an 8 MP rear and 2 MP front cameras. The smartphone comprises 16GB internal memory, expandable up to 32 GB with a microSD card slot. On connectivity front, Galaxy Note supports Bluetooth 3.0, WiFi, GPS, HSPA+. The device is quite powerful as far as the specifications go but in terms of the price, it might be a downer for many buyers. The Samsung Galaxy Note has been priced at Taka 55000($685). It is now available in various stores without warranty. If warranty is important for you 60300 is the asking price of Electra Int. They are giving 1 year of warranty service with Samsung Galaxy Note in Bangladesh. In India you can buy unlocked Samsung Galaxy Note for Rs 34990. You can also buy Samsung Galaxy Note from Amazon too. They are asking $650 for unlocked 16GB Samsung Galaxy Note N7000. It will be available after 26 December online.